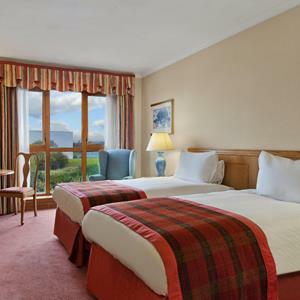 Hilton Coventry HotelWith excellent links to the M6, M40, M42, M69 & M1 motorways, this Coventry hotel is within easy reach of local shopping centres, business centres and sightseeing attractions. Experience over a Thousand Years of History at Warwick Castle, discover the Dungeons and ‘Merlin’ Dragon Tower or visit the birthplace of the most famous playwright, William Shakespeare. The hotel is located just a 30 minute drive from Birmingham’s Bullring or Mailbox Shopping Centers where you can shop till you drop. Sip cocktails at Hemingway's Bar or enjoy a traditional British Sunday lunch at Voyageurs Restaurant. Plan an event in one of 13 meeting rooms for 2-600, hold a function in the impressive, newly refurbished Minster Suite or catch up on e-mails in the business center. In your room, keep in touch with friends and work with high-speed internet access. Upgrade to a Deluxe Room or a Deluxe Room Plus for extra space to relax. Enjoy the cinema and bowling alley at the nearby leisure center, or play a round of golf at one of two nearby courses. With excellent links to the M6, M40, M42, M69 & M1 motorways, this Coventry hotel is within easy reach of local shopping centres, business centres and sightseeing attractions. Experience over a Thousand Years of History at Warwick Castle, discover the Dungeons and ‘Merlin’ Dragon Tower or visit the birthplace of the most famous playwright, William Shakespeare. The hotel is located just a 30 minute drive from Birmingham’s Bullring or Mailbox Shopping Centers where you can shop till you drop. By Road: Located off junction 2 of the M6/M69 interchange and only a short drive from both the M1 and M40. By Public Transport: From bus station in Coventry city centre (Pool Meadow) take number 32A bus.